Scroll to the bottom of this page to see details about the 20-0478 Fuel Rail Plumbing Kit. 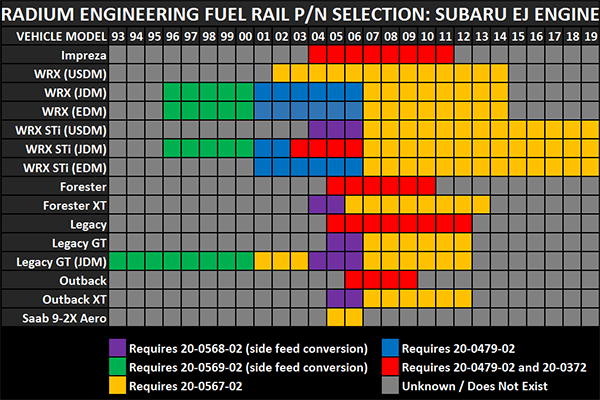 Reference the chart below to be sure the proper fuel rails are ordered. Manufactured with a large internal bore, the fuel rails can support all necessary engine power requirements. 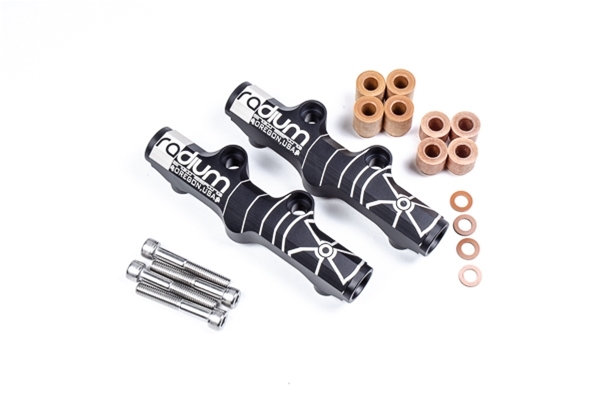 They are CNC machined from solid 6061 aluminum, black anodized, and laser etched for a high quality surface finish. For injector height flexibility and thermal insulation, 2 sets of machined phenolic spacers are included. 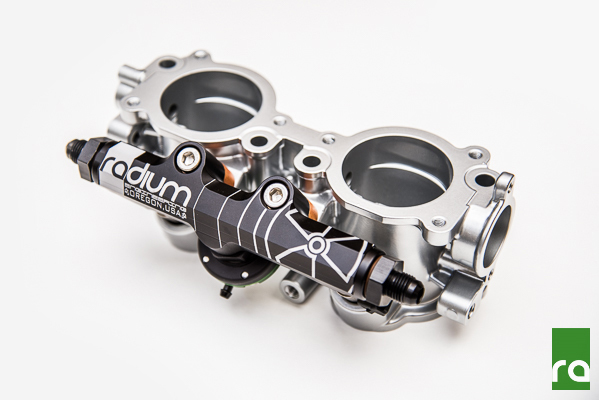 All injectors must use 11mm diameter upper O-rings just like the OEM Subaru injectors. The fuel rails are compatible with all fuel types including popular alcohol mixtures such as E85. 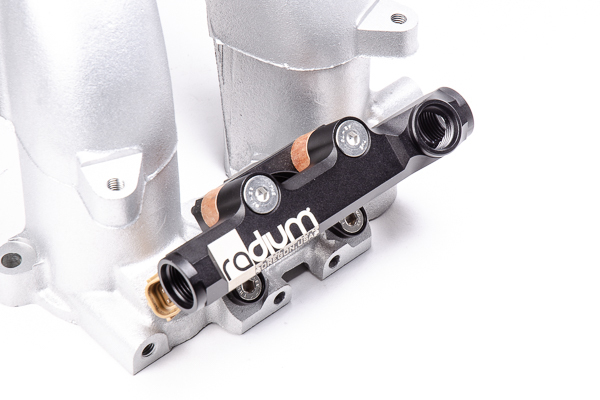 These fuel rails have the same mounting and injector spacing as the 20-479-02 (below). 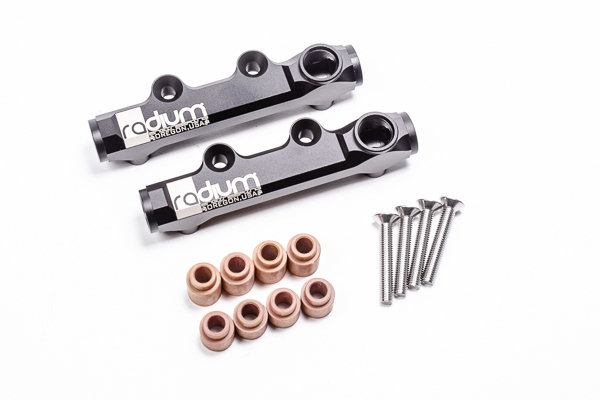 However, these fuel rails feature a 8AN ORB port machined in the underside center of each fuel rail. NOTE: The center port bulge (shown above) can create an interfere with early AVCS solenoids found in the EJ207 and JDM EJ205. See 20-0479-02 below. 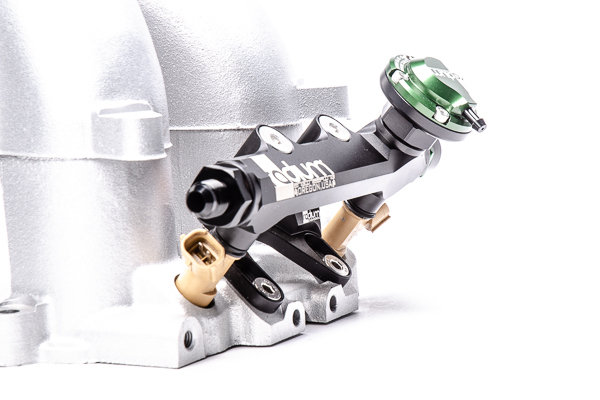 These fuel rails have the same mounting, injector spacing and fitment as the 20-0467-02 (above). However, each fuel rail has an 8AN ORB "top port", unlike 20-0467-02 which has a center lower port (picture below shown with Fuel Rail Adapter 20-0372). 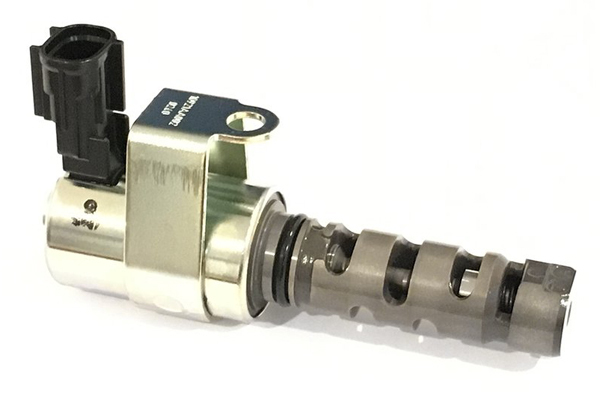 The added clearance is necessary for the EJ207 and JDM EJ205 engines that have early AVCS solenoids with vertical connectors (shown below). 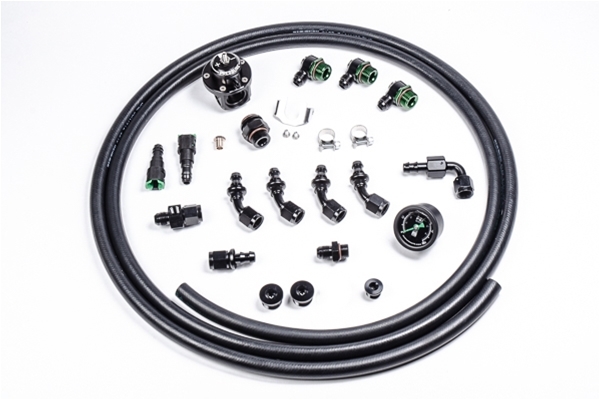 This engine bay plumbing kit is designed to be used with all Radium EJ fuel rails and includes all the necessary fittings, hose and other components to complete the installation and have a complete operating system. This kit plumbs the fuel rails in series, beginning and ending at the factory hard lines near the LH strut tower. It is compatible with all factory hard lines, whether SAE quick connect or hose barb connections. 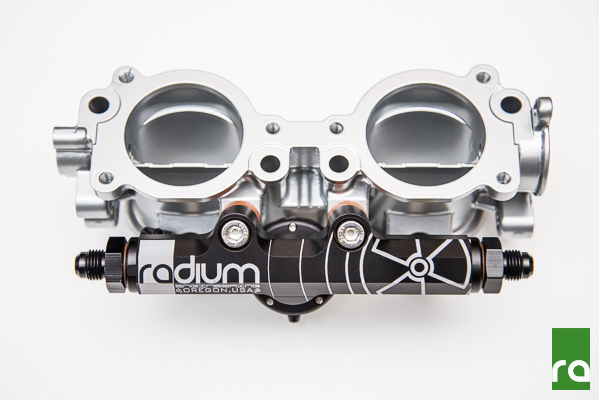 An adjustable Radium Direct Mount Regulator (DMR) is included along with a Radium fuel pressure gauge to calibrate the DMR. The 6AN swivel adapter fittings for the fuel rail ports are low profile making them ideal for the tight spaces associated with the EJ motor. Pushlock hose-ends are easy to work with, making installation quick and painless. A variety of hose-ends are provided so the installer can custom tailor the fuel line routing for their specific vehicle. A parallel feed system is not possible with this kit. The fuel hose included in this kit can be cut and installed with standard tools and without special skills. Unlike standard low-quality rubber fuel hose that degrades with alternate fuels, the provided Vapor Shield hose is resistant to all fuels including E85. Furthermore, the hose has a thermoplastic armor layer that guards against unwanted vapor permeation (gas smell). And unlike PTFE, this fuel hose helps absorb absorbs unwanted fuel injector pulses and has an easy to work with bend radius.